The recent hack attack against Sony, which some believe was perpetrated by North Korea in retaliation for the studio's upcoming movie The Interview, which depicts the assassination of that country's leader Kim Jong-un, keeps on bringing new and interesting information from the studio in regards to their upcoming slate. The Wall Street Journal, which has gotten their hands on the latest batch of stolen emails, confirm that Sony is planning to merge two of their most successful franchises with a Jump Street / Men in Black crossover movie. Emails from Sony chief Amy Pascal reveal that the two cops played by Jonah Hill and Channing Tatum in 21 Jump Street and its sequel 22 Jump Street will team-up and interact with the universe seen in the Men In Black films. While both actors are expected to return, neither Tommy Lee Jones nor Will Smith will appear in the movie, though cameos by both stars are not being ruled out. "Jump Street merging with mib i think that's clean and rad and powerful." "We don't have a script yet so we'll be green lighting the movie off the concept and the talent involved." The leaked documents indicate that this is one of the highest profile projects in development at Sony at this time. Executives are eager to move ahead with the project as soon as possible. 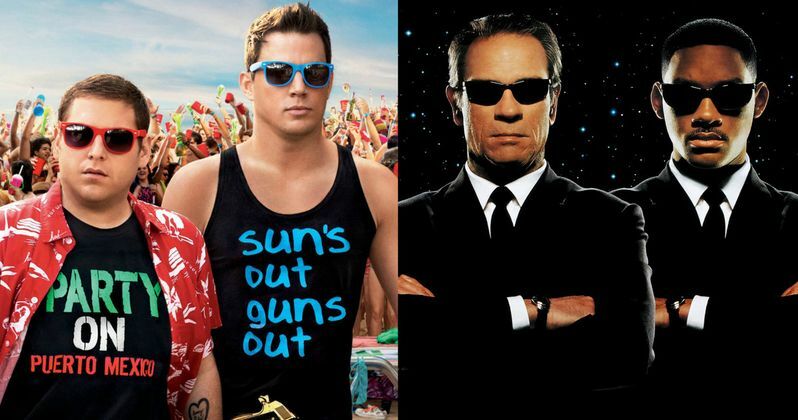 Sony wants to release the Jump Street/Men in Black Crossover Movie in either 2016 or 2017. The hope is to not only continue to keep the Jump Street franchise fresh, but also rejuvenate the Men in Black series, which didn't do as well as expected with Men in Black 3 and actually lost money for the studio.